But a rug also helps muffle sounds and add warmth, both literally and figuratively. It protects your feet from cold, bare floors, while also helping hide less-than-attractive ones. A rug is not limited to bare floors. You can throw one over carpeting as well or use a special one as a wall hanging to accentuate or create more visual interest. But how do you go about selecting the right floor covering? Colors and patterns primarily drive choices. However, in a dining room, you might want to consider other factors. While size is an important consideration when choosing any rug, it is even more so important to consider when buying a dining room rug. Ideally, a dining room rug should be large enough to let you place your dining table and chairs on it. There should be enough room so that when chairs are pulled away from the table, they still have their back legs on it. When measuring for your rug, don't forget to take into account the length of your table fully extended. Measure to account for any leaves that you use. Measure the room to see how your rug fits in. It is best to leave equal amounts of space on the sides for a balanced effect. Choose a size that lets the rug end before it reaches the front legs of a sideboard, china cabinet, freestanding bar or any other furniture other than the table and chairs that you have in the room. Never rest just the front legs of a piece of furniture on the rug because it affects the balance. If there is no way to avoid this, prop up the rear legs on rubber or wood shims. 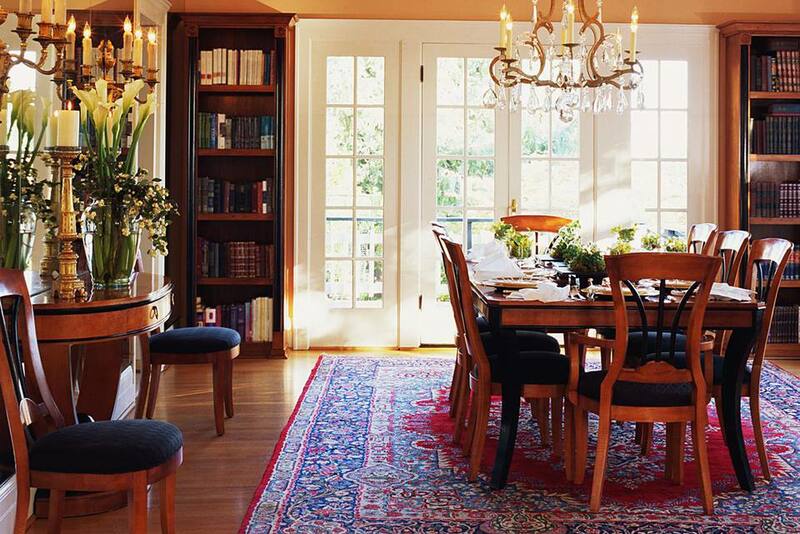 Choose a rug shape to complement your dining room furniture. Most dining room rugs are rectangles, but any shape can work. It is most pleasing to the eye for the rug to reflect the shape of the table. A long, narrow table looks best on a narrow rectangle. A round rug emphasizes the shape of a round table. A dining room rug has heavy pieces of furniture sitting on it. Chairs are pulled out and pushed in. Accidents with food may happen, and there will be crumbs even if there are never any major spills. Your budget might also play a part in choosing a material. A dining rug is likely to get a lot of wear and tear, so a rug material that cleans up easily and can stand up to heavy use gets points on the plus side of the balance sheet. If you prefer natural material, be aware that silk or cotton rugs are not likely to stand up to this kind of use. Wool is a good choice, but it is also an expensive material. Human-made fibers are easy to clean and maintain. Look into indoor-outdoor rugs. They have come a long way and have considerably improved in look and feel. Choosing a color or pattern is an important consideration. Those two elements provide the eye appeal and interest in your dining room. The color of your rug can provide a starting point for your room's color scheme or a way to tie together colors. Decide on how you want the color of your dining room rug to function: to accent, create drama, bring warmth or tone down the mood. Multicolor and patterned rugs have the advantage of disguising spills. While medallion prints are often chosen for dining rooms, you might want to go with an all-over pattern. The medallions get hidden under the table. Stripes make the room look wider or longer. Choose a pattern that harmonizes with the furniture period. A Persian or Oriental rug sets the right mood with traditional furniture, while a plain-colored rug with interesting texture or a striped or geometric pattern works better with midcentury-modern pieces. While you will never see the rug pad once it's installed, you will feel it every time you step onto the rug or clean it. The rug pad helps anchor the rug to the floor and keep it from wrinkling or slipping. That makes a rug safer as well as more aesthetically pleasing to look at. A dense rug pad makes the rug feel more plush and luxurious. It also makes it easier to clean.